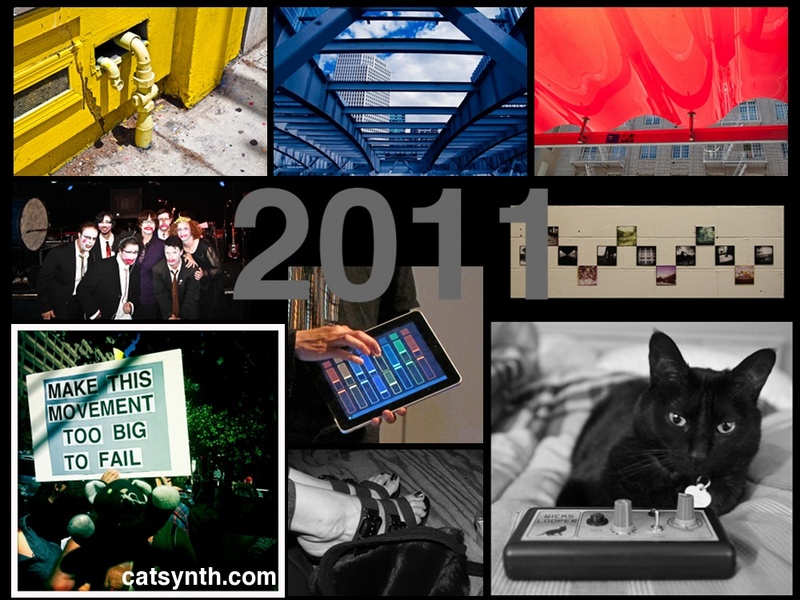 As has become a tradition here at CatSynth, we present our end-of-year image. It was a bit of a challenge to decide what to put in, as there were so many this time. But I think these are particularly representative. And it’s also significant that it is more colorful than previous end-of-year images. The first few days of this year were quiet and a bit dark. That changed quickly, with tumultuous events around the world, and new experiences close to home. It’s the year I finally had a photography show, and by the end of the year I had several. There were new surprising types of performances and the costumes to go with them. I deepened my connections back in New York with friends, music, art and the landscape. And I no idea what I would have the chance to participate in something like the Occupy movement . There were many sad moments as well, with the loss of friends. Happy New Year and thank you for all the support and warmth from those who read these pages! Today we present Luna with the Wicks Looper. Luna is making a rare Monday appearance for World Cat Day. Of course, every day feels like “cat day” here, but we’re happy to participate with this elegant photo. Once again, I will have the monome controlling the MacBook, primarily for live sampling and looping today. 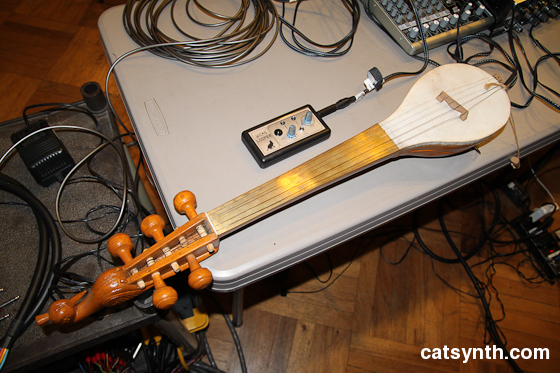 I will be using the dotara, an Indian folk string instrument, as one of the live sample sources. I will also bring a bell and the prayer bowl as live sources. The iPad will be running Curtis, which gets more an more advanced with each upgrade and is becoming a true musical instrument. I will also be using TouchOSC to control Open Sound World, including a brand new implementation of my piece Charmer:Firmament for iPad, replacing the retired Wacom graphics tablet. This is a dry run for the big concert next Friday (March 4), so we’ll see out it goes. I had been hoping a new contact mic would arrive today – I am considering that for March 4 as well – but of course FedEx showed up just while I was out at an important art-related meeting, so I missed it and they are the one courier that won’t leave things. 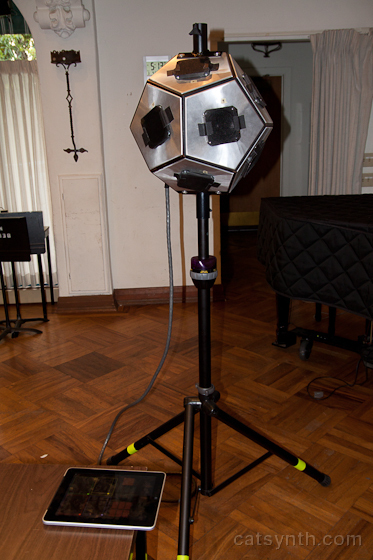 So I will be using an ordinary mic once again for the live sampling/looping – maybe it’s for the best. Update: Just as I finished posting this article, a package arrived. Not the contact microphone, but it was an exciting new toy, the Wicks Looper. You see previous CatSynth pics and videos with this and related devices via this link (the cat in most of these is also named Luna). I have been considering getting one these for a while, and the current run of performances provided the impetus. Although I have not yet played it, I am seriously tempted to try it out for tonight’s set. After all, what’s the worst that could happen?